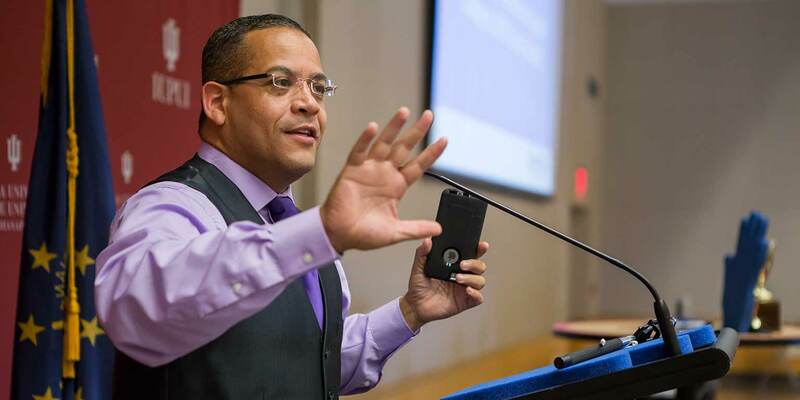 RTV6's Emmy Award-winning consumer investigative reporter and news anchor Rafael Sanchez is an unapologetic, no-nonsense consumer advocate. Getting justice for those who have been taken advantage of is one of his passions. Another passion: giving back to the Indianapolis area community that he's adopted as his own. In this Sanchez shares a great deal with IUPUI, where he has appeared on numerous occasions to support the campus community as well as causes that help transform neighborhoods and improve lives. When he's in front of the camera, Sanchez is relentless and unflinching in his journalistic pursuit to right wrongs and find the truth. However, his sometimes-intimidating television persona is just one facet of this multi-dimensional man. He's also a baseball dad, a ballroom dancer, and a fun-loving jokester who doesn't take himself too seriously, especially in the name of community service. As co-emcee of this year's Indiana Black Expo (IBE) Corporate Luncheon, sponsored by Indiana University, Sanchez donned a pineapple-printed suit and rode a bicycle around the Indiana Convention Center. His goal: encourage people to fill the donation envelopes on every table with contributions to the many community programs and initiatives that IBE supports. 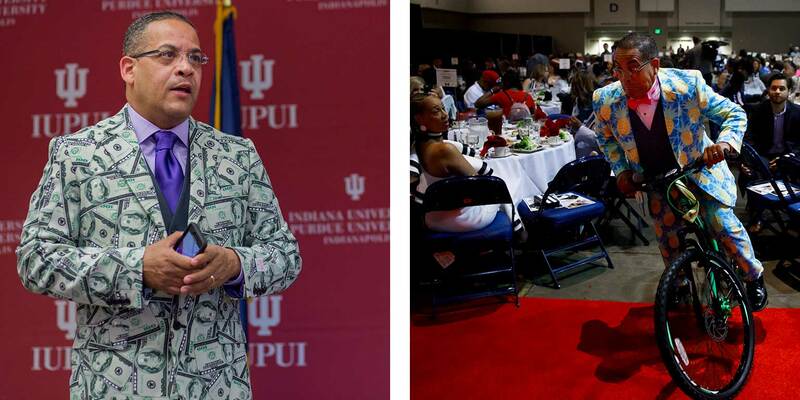 In his role as Community Engagement Co-Chair for the United Way of Central Indiana, an organization to which IUPUI has a deep and lasting commitment, Sanchez emceed the IUPUI United Way Kickoff Luncheon in 2016, sporting light-up shoes and an Uncle Sam hat, and again in 2017, wearing a jacket patterned with $100 bills. In many different ways, Sanchez lights up any room he enters and draws attention to the ways people can give back to the community. The takeaway from his charitable work, according to Sanchez, is that "everyone has time and talents to contribute to the community. You don't have to be rich or famous or even a good dancer." "Rafael personifies the community focus of both the IUPUI and United Way missions. He brings laughter and fun to our United Way campaign kickoff luncheon while helping us see the possibilities to make a real difference in a celebratory yet encouraging way," says Stephan Viehweg, co-chair of IUPUI's United Way campaign, assistant research professor in the Department of Pediatrics at the IU School of Medicine, and associate director of the IUPUI Center for Translating Research Into Practice. Originally from the Bronx, Sanchez has been a fixture in Indianapolis for more than 20 years. He participates in dozens of charitable events around Central Indiana each year for causes that increase financial stability, decrease food insecurity and homelessness, and improve educational opportunities, among others. He is the recipient of many awards for excellence in journalism, including Best Metro TV Reporter awards from the Associated Press and Best Consumer Reporting awards from the Society of Professional Journalists. Sanchez has also been recognized for his civic involvement by the Center for Leadership Development, Forest Manor Multicultural Center, Ronald McDonald House and Mozel Sanders Foundation.